Grosgrain: "Thrift Store Shopping Do": Look Large! "Thrift Store Shopping Do": Look Large! I want to give you my number one rule when thrift shopping for clothes. If you find something that is too big or WAYY to big it is sooo NOT a problem. In fact in some ways, it can be better . Take this dress I found on Wednesday. It was a size 14 and way too long but I liked it's beachy look. 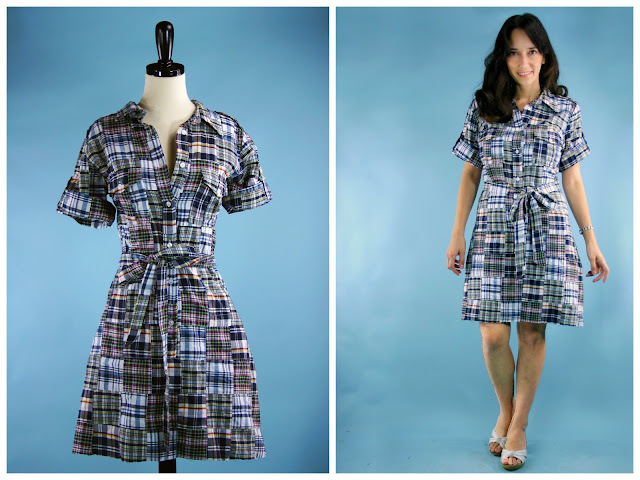 Not every thrift store dress needs a total makeover. Sometimes all you have to do to have a great find and a great bargain is a little tweaking. First I turned it inside out and put in on. Then I pinned along the sides to fit my shape, and took it off. Then made one quick line of stitches on either side. Then I cut 6 inches off the bottom and used the extra fabric to make a matching belt around the waist. Voila! A new perfectly sized dress for only $2. Wonderful looking dress! I've done this a few times, and I agree...buying big is so not a big deal as long as you own a sewing machine! What an awesome idea! I would have never thought to do that! Can't wait to hit up some thrift stores this weekend! You are a genius! And truly inspire so many of us. Keep going. This is a wonderful tip!! I do this all the time! Do you have any tips for making small items larger? I often find great vintage clothes that are just too small in certain areas, arm holes, etc. I just did the exact thing with a shirt that was Way too big and now it fits great. I am washing it now and will soon have a "new" green shirt. It was from a pile of free clothes so to make it better it only cost me thread! Very cute! I've always thought of doing things like that but worried that I was off-base. Or that some part of the garment would be really unmanageable - like shoulders and sleeves. Thanks for the encouragement. thank you for the tips! I didn't realize it was so simple. I did this recently and was SO excited about it. I did take it to my taylor to have it altered properly, but with alterations and a $5.00 price tag I spent under $25 on a dress that would probably retail in a store for a least $80.00. Thank you for the inspiration, you are wonderful! Anyone have some leads on great thrift stores in the Marietta, Dallas, or Smyrna, GA area? I never thought to do that! I will be GW shopping with a whole new look now. thanks, any other tips for repurposing thrift store clothes? Sometimes I find clothing that would be too big on me and see: "Ah-Hah! Fabric!!" This is also known as re-purposed fabric when made into something else. You are so inspiring. Thanks for making it seem so simple and easy to do and for letting us know how to it too. I'm sorry to say my problem is often finding something big enough, lol, but this is darling and such a great idea! I always love thrift shopping and I find big clothes to be good for me since I can always alter it. I love that dress that you found. :) To mention the price, it's a bargain! Seeing this dress makes me super excited to go thrift store shopping! The dress looks super cute! Do you have any suggestions to get the Goodwill smell out? I think that they use some intense detergent (because all Goodwills smell the same), but on some clothes I have a hard time getting the scent off. PS - I love your refashions!